Notice anything interesting about the sentence in this screenshot? Yes, it contains every letter in the English latin alphabet. Incidentally, it is set in Lucida Grande regular typeface. But what’s interesting about it, to me, is how the underlining breaks around the descenders— those tails of the letters q, j, p, y, and g that "descend" below the baseline. I learned a long time ago that professional typography calls for minimal use of underlining, and when you must underline, you should place the underlines by hand so that they break before and after descenders. That way, you don’t get aesthetically displeasing line crossings on the letters. What I didn’t know was that Mac OS X’s TextEdit program automatically breaks underlines before and after descenders. I don’t know when this feature was added, but I never noticed it before now. It’s great that there’s a program that automates the breaking of underlines so that they don’t cross descenders. It’s interesting to me that TextEdit — a program that comes with the Mac OS — does this, but Pages, a more advanced text editing and layout application, does not. I think it would be a good thing if Pages would offer all the features that TextEdit offers. Perhaps they will integrate Pages more with the Mac OS X font panel in the next version. I notice you can use the font panel to choose fonts and styles in Pages, but the underlining does not break around descenders in Pages the way it does in TextEdit— or MacJournal, for that matter, which integrates with the Font Panel as well as TextEdit does. Am I missing something? Does Pages ’09 automatically break underlines around descenders? Are there other word processing programs that do? I would love to hear more about this from your experience. Why are there nearly identical fonts? I learned from the movie Helvetica that the reason Arial is nearly identical to Helvetica is that Microsoft didn’t want to pay license fees to distribute the Helvetica font so they hired Monotype to modify Linotype’s Helvetica slightly. They just made sure to keep the same font metrics so that a document written in Helvetica would have the same layout and pagination in Arial and vice versa. But I don’t always understand why there are other fonts that are nearly identical but with different font metrics and/or line spacing; for instance, why are Monotype Corsiva and Apple Chancery so similar? Is it because Apple wanted their own copyright on a font similar to Monotype Corsiva? And why are Bordeaux Roman Bold LET and Monotype Onyx so similar? Is it because Microsoft commissioned Monotype to create Onyx in 1992 after LET created Bordeaux Roman Bold in 1990? Or is there just a “me too” factor involved, in which each foundry wants a product to fulfill similar demands? I’ve spent some time looking at the differences and similarities, and I’ve noticed that Bordeaux Roman Bold has ligatures and a more extended character repertoire than Onyx, though Onyx is a bit bolder and easier on the eyes. Also, I like the tighter line spacing of Onyx. So it’s a hard to choose a favorite between Bordeaux Roman Bold and Onyx. It’s easy to pick Apple Chancery over Monotype Corsiva because Apple Chancery has a beautiful set of of both common and rare ligatures, more calligraphic letters (especially the slashed dot on the lowercase i), and a much larger character repertoire than Corsiva. When it comes to extended characters, Times New Roman beats Times, but I’ll choose Times almost every time because of its pretty ligatures. If I needed to format a text with rarer characters, though, I would choose Times New Roman. As with the choice between any two similar fonts, it comes down to the application— how many extended characters do you need for what you want to write? Do you know more about the history behind fonts that are nearly identical? If so, please leave a comment and share the knowledge. Thanks! I recently reviewed all the fonts on my computer that had embedded descriptions, and I typeset the descriptions in their respective typefaces. The result is a demonstration of the typefaces and their history, features, and uses. To view these font descriptions in their proper typefaces you must have the fonts installed and enabled on your computer. 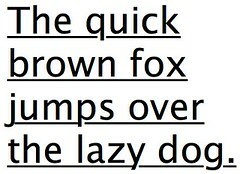 To see the ligatures you will have to use a browser that supports them (Firefox 3.5 and later does). For the truest view, see Fonts with Descriptions (PDF). Below is the document in HTML format. “Andale Monospaced is a highly legible monospaced font.” Regular only. Arial Black: “…display use in newspapers, advertising and promotions.” Regular only. Arial Narrow: “…an extremely versatile family of typefaces which can be used with equal success for text setting in reports, presentations, magazines etc, and for display use in newspapers, advertising and promotions.” Regular, Italic, Bold, and Bold Italic. Book Antigua: “This is a roman typeface based on pen-drawn letters of the Italian Renaissance. Because it is distinctive and gentle in appearance it can be used to give a document a different feel than is given by the more geometrical designs of most text faces. It is also useful for occasional lines, as in letter headings and compliments slips. Its beautiful italic has many uses of its own” (italicization mine for demonstration purposes). Regular, Italic, Bold, and Bold Italic. Bookman Old Style: “The origins of Bookman Old Style lie in the typeface called Oldstyle Antique, designed by A C Phemister circa 1858 for the Miller and Richard foundry in Edinburgh, Scotland. Many American foundries made versions of this type which eventually became known as Bookman. Monotype Bookman Old Style roman is based on earlier Lanston Monotype and ATF models. The italic has been re drawn following the style of the Oldstyle Antique italics of Miller and Richard. Although called ‘Old Style’, the near vertical stress of the face puts it into the transitional category. A legible and robust text face” (italicization mine for demonstration purposes). Regular, Italic, Bold, Bold Italic. Brush Script MT: “This heavy, informal script looks as though it was written with a brush because its lowercase letters join together. Use the uppercase letters primarily as initials, although you might find it interesting to use all CAPITALS of this typeface for some words” (capitalization mine for demonstration purposes). Regular only. Consolas “is aimed for use in programming environments and other circumstances where a monospaced font is specified. All characters have the same width, like old typewriters, making it a good choice for personal and business correspondence. The improved Windows font display allowed a design with proportions closer to normal text than traditional monospaced fonts like Courier. This allows for more comfortably reading of extended text on screen. OpenType features include hanging or lining numerals; slashed, dotted and normal zeros; and alternative shapes for a number of lowercase letters. The look of text can be tuned to personal taste by varying the number of bars and waves.” Regular, Italic, Bold, and Bold Italic. Century Gothic: “A design based on Monotype 20th Century, which was drawn by Sol Hess between 1936 and 1947. Century Gothic maintains the basic design of 20th Century but has an enlarged ‘x’ height and has been modified to ensure satisfactory output from modern digital systems. The design is influenced by the geometric style sans serif faces which were popular during the 1920’s and 30’s. Useful for headlines and general display work and for small quantities of text, particularly in advertising.” Regular, Italic, Bold, and Bold Italic. Century Schoolbook: “Another member of the Century family which was based on Century Expanded. Designed to fulfill the need for a solid, legible face for printing schoolbooks. It is wider and heavier than Century Expanded, there is also less contrast between thick and thin strokes. First cut by Monotype in 1934 and based on versions from ATF and Lanston Monotype. The sturdy nature of this typeface, coupled with its inherent legibility, has made it a popular choice for setting books, newspapers and magazines.” Regular, Italic, Bold, and Bold Italic. Comic Sans MS: “Designed by Microsoft’s Vincent Connare, this is a face based on the lettering from comic magazines. This casual but legible face has proved very popular with a wide variety of people.” Regular and Bold. Curlz MT: “Curlz was designed by Steve Matteson and Carl Crossgrove in 1995. For a unique, festive touch, add a little Curlz to posters, flyers, invitations, menus and tee shirts.” Regular only. Franklin Gothic Book & Franklin Gothic Medium: “Designed in 1902 by Morris Fuller Benton for the American Type Founders company, Franklin Gothic Book still reigns as one of the most-widely used sans serif typefaces. Originally issued in only one weight, the ATF version of Franklin Gothic was eventually expanded to include five additional weights, but no light or intermediate weights were ever developed. In 1979, under license from ATF, ITC developed four new weights in roman and italic: book, medium, demi and heavy. Designed by Victor Caruso, ITC’s new weights matched the original face’s characteristics, but featured a slightly enlarged lowercase x-height. ITC Franklin Gothic also features a slightly condensed lowercase a-z alphabet. In 1991, ITC commissioned the Font Bureau in Boston to create condensed, compressed and extra compressed versions of ITC Franklin Gothic, which increased the flexibility and usefulness of the design.” Franklin Gothic Book: Regular and Italic; Franklin Gothic Medium: Regular and Italic. Garamond: “This typeface is based on roman types cut by Jean Jannon in 1615. Jannon followed the designs of Claude Garamond which had been cut in the previous century. Garamond’s types were, in turn, based on those used by Aldus Manutius in 1495 and cut by Francesco Griffo. The italic is based on types cut in France circa 1557 by Robert Granjon. Garamond is a beautiful typeface with an air of informality which looks good in a wide range of applications. It works particularly well in books and lengthy text settings” (italicization mine for demonstration purposes). Regular, Italic, and Bold. Gill Sans Ultra Bold: “…used for display in advertising, packaging, and labels.” Regular only. Impact: “1965. Designed for the Stephenson Blake type foundry. A very heavy, narrow, sans serif face intended for use in newspapers, for headlines and in advertisements. Aptly named, this face has a very large “x” height with short ascenders and descenders.” Regular only. Perpetua: “A sensitive adaptation of a style of letter that had been popularized for monumental work in stone by Eric Gill. Large scale drawings by Gill were given to Charles Malin, a Parisian punch-cutter, and his hand cut punches were the basis for the font issued by Monotype. The incised quality of Perpetua will lend distinction to any work compatible with its serenity. First used in a private translation called The Passion of Perpetua and Felicity; the italic was originally called Felicity. Widely used as a text face in quality books, Perpetua is also very popular in advertising and display work.” Regular, Italic, Bold, and Bold Italic. Perpetua Titling: “…popular in advertising and display work.” Light & Bold. Rockwell “is a distinctive version of a geometric slab serif design, which has retained its popularity since its appearance in the 1930’s. The slab serifs, or Egyptians, originated in the nineteenth century when they were used principally for display work. Rockwell is notable for its judiciously clipped slab serifs, and is given a particular sparkle by means of its angular terminals. In more recent years this style of typeface has been increasingly used for text setting where their even colour and visual impact can be fully exploited.” Regular, Italic, Bold, and Bold Italic. Rockwell Extra Bold: “…used principally for display work.” Regular only. Stencil: “Stencil faces have been made for as long as people have been shipping wooden boxes. Most of the letterforms look a bit like a softer, bolder Clarendon before lines are cut through it to allow counters (those little spaces enclosed in ‘a’, ‘b’ and other letters) to remain as counters without becoming solid blobs. Consider this Stencil face a decorative font for limited use; a little goes a long way.” Regular only. Trebuchet “…designed by Vincent Connare in 1996, is a humanist sans serif designed for easy screen readability. Trebuchet takes its inspiration from the sans serifs of the 1930s which had large x heights and round features intended to promote readability on signs. The typeface name is credited to a puzzle heard at Microsoft, where the question was asked, ‘could you build a Trebuchet (a form of medieval catapult) to launch a person from the main campus to the consumer campus, and how?’ The Trebuchet fonts are intended to be the vehicle that fires your messages across the Internet. ‘Launch your message with a Trebuchet page.’” Regular, Italic, Bold, and Bold Italic. Zapfino: “Today’s digital font technology has allowed renowned type designer Hermann Zapf to realise a dream he first had more than fifty years ago: to create a fully calligraphic typeface.” Regular only. Contains several typographical features including ligatures apparent in the phrase “File systems for affluent field offices”. Monotype Corsiva: “An italic typeface made in the style of the early Italian cursives, as exemplified by the work of the writing master Ludovico degli Arrighi in the sixteenth century. The capitals are of swash design, with characteristic flourishes, designed primarily for use as initial letters. Corsiva can be used for short text passages in advertising but is best used to add sparkle to invitations, greeting cards and menus, and to give a sense of occasion to certificates and awards.” Regular only. At the end of each font description quoted, I add information about the styles available in that font family, and I typeset each style name in its respective style; e.g., italic is in italics. I also add information about typographical features along with demonstrative samples. These fonts vary in size even at the same point sizes. I could have normalized the sizes, but I decided to leave them as is so you could see what their relative sizes are. I did not specify anything special in the formatting except that I found that I had to give the Zapfino font a 300% line-height so the descenders wouldn’t collide with the ascenders. To learn about the fonts installed on my computer (Mac), I opened the Font Book application and selected the “Show Font Info” command in the View menu while previewing each font. I learned that most of the fonts on my Mac do not have descriptions, but the ones that do offer some interesting historical and usage tips. I also learned is that Microsoft made a typographical leap when they came out with Windows Vista. I was not aware of all the advanced typographical features in their core fonts Calibri, Cambria, Candara, Consolas, Constantia, and Corbel, and I must say I am impressed. A note to Bitstream, International Typeface Corporation, Linotype Microsoft, Monotype, and Neufville Digital: I do not intend any copyright infringement by displaying these fonts and their descriptions. Please write to me if there is anything I need to add or remove from this document. Thank you for all your good work!